The Harlem Fire Watchtower, also known as the Mount Morris Fire Watchtower, is the only surviving one of eleven structures placed throughout New York City beginning in the 1850s. Julius B. Kroehl was awarded the contract in 1855 with a bid of $2300 under bidding James Bogardus who bid $5750. Kroehl followed Bogardus’s design and theory. He completed the structure in 1857. Employing then-revolutionary building technology, these early examples of post-and-lintel cast-iron architecture inspired the steel cages developed in the 1880s to support skyscrapers. Marcus Garvey Parks Fire Watchtower is the only surviving example of this type of structure. During the New Deal, the area surrounding the Watchtower was rebuilt by government employees as part of the Works Project Administration jobs program. This project created a series of gracious plazas known as “the Acropolis”, which surrounds the Fire Watchtower, stone retaining walls, and wide steps lead pedestrians up to 4 look out terraces with views in all directions of New York City. The Fire Watchtower was still standing due to its protected location atop of the mountain of Manhattan Schist in the center of Marcus Garvey Memorial Park, formerly Mt. Morris Park. The tower was designated a New York City landmark in 1967 and was listed on the National Register of Historic Places in 1976. Through the support of the Marcus Garvey Park Conservancy and the Manhattan Borough President, Parks undertook a major stabilization of the structure in 1994. The Fire Watchtower has a long history of community residents advocating for its restoration. In 2000 Angel Ayon, then an Architecture student at Columbia University began a campaign to create awareness about the tower focusing not only the towers architectural significance but also its cultural significance. 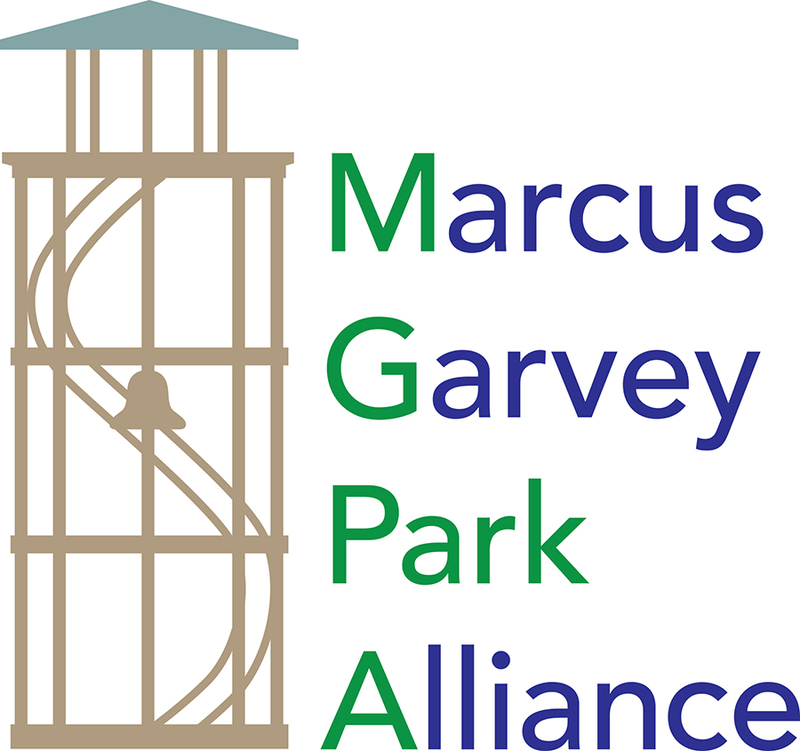 The Marcus Garvey Park Alliance and the Mt. Morris Park Community Improvement Association, Community Board Eleven and a wide range of community stakeholders and elected officials have worked collaboratively with NYC Parks to protect and restore the tower. In 2013 MMPCIA President, Syderia Asberry-Chresfield and Vice President Laurent Delly organized the Fire Watchtower steering committee. Angel Ayon, AIA (Architect and Preservationist), Kathleen Hulser and Connie Lee, (current President of the Marcus Garvey Park Alliance) attended the first meeting. Over a period of several weeks a wide range of community stakeholders including local political strategist Chet Whye joined the steering committee culminating in the allocation of $1.8 Million dollars from then City Council member Inez Dickens and $1 Million dollars from then Manhattan Borough President Scott Stringer. Additional funding was provided by Manhattan Borough President Gale Brewer, the Central Park Conservancy and NYC Parks. The total cost of restoration of the Fire Watchtower is over $6 Million dollars. The Harlem Fire Watchtower in Marcus Garvey Park is currently offsite being restored. A majority of the cast iron pieces are being re-cast and the re-installation of the tower is expected to be complete January 2019.